Like the earlier Jaguar XK8 / R (X100) models the new X150 2006 to 2014 with it's fully silenced exhaust system does not sound like the fantastic GT Sports Car it actually is. Especially at idle and low speed cruising the engine sounds too quiet and flat. The standard XK (150) has fairly standard Oval type finishers. Better to have the much larger and impressive Quad finishers as fited to the later XK models including the XKRS GT. These high grade rear stainless steel rear exhaust sections with large impressive quad finishers are designed to replace the large and heavy rear exhaust box thereby providing a net 25 Kgs weight saving contributing further to the car's excellent power to weight ratio. The exhaust sections provide a louder and more sportier V8 growl both at idle and all through the rev range . The car sounds and feels like a proper GT Sports Car and will not go unnoticed wherever you go. The large rear quad finishers will not fit into the small recesses of the standard diffuser so we recommend also our new rear diffuser designed to work with the above system. See below a short video of an XK8 fitted with the sports rear sections and the resulting great V8 growl and look of the rear exhaust. See below an image of an XKR fitted with the rear exhaust sections, quad trims and the larger rear diffuser to accommodate the much larger trims. * Fantastic V8 growl through all the rev range. * Precision engineered and easy to fit. * Improved performance by increasing bhp (approx 7 bhp) and weight saving. * Large quad tips giving the rear of the car an upgraded finish and more sporty style as per the later X150's including the XKRS GT. 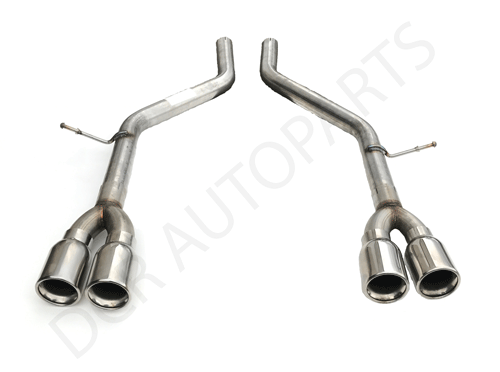 * Designed to be compatible with our replacement front exhaust sections should you wish to or need to change these in the future. * Brackets supplied at no additional cost - unlike some other suppliers we don't agree with sending a customer an exhaust system without the brackets to fit it !